The hanging leg raise is an expert-level isolation exercise for hip extensors and the abdominal muscles. Hanging from a bar by your extended arms, you raise your legs parallel to the ground. It is a more intense version of the vertical leg raises in the ​captain's chair. While the traditional crunch and its variants give a top-down approach, the hanging leg raise is a bottom-up approach that works the abs in a different way than many ab exercises. You can add this exercise to an advanced core workout. The muscle most worked in the hanging leg raise is the iliopsoas hip flexor. The iliopsoas flexes the hip to draw the thighs to the trunk and rotates the spine. It connects the spine and hip to the top of the femur and acts to pull them towards each other. The synergistic muscles that work during the hanging leg raise are the tensor fasciae latae, pectineus, sartorius, the adductor longus, and adductor brevis. The stabilizing abdominal muscles during this exercise are the rectus abdominus and the obliques. Advanced ab trainers can use this exercise to vary their ab routine. Many think it targets the lower abs especially well, but the effects you get depend on how far you are able to raise your legs. Most of ab work happens as you continue to raise your legs past parallel to the floor. You need a high bar that you can grasp at a height above your head. It must be stable and able to support your full body weight as well as withstand the stresses added as you raise and lower your legs. A chin-up bar is a good choice while using a random door frame or ledge could result in damage to it as well as yourself. A round bar would be more comfortable than a squared-off bar or square wooden beam. It can have hooks or rings attached to grasp, or you can grasp the bar itself. Some exercise frames may have ab straps attached, supporting your upper arms while you grasp with your hands. Grasp a bar above your head. You don't have to necessarily be hanging at this stage, but ideally, the grip does have to be well above your head. An overhand grip with your thumb around the bar will be the most stable. Pull your shoulder blades down and back, engaging your lats. Tilt your pelvis backward. Engage your abdominals and hip flexors to lift your feet off the ground by raising your legs outward in front of you, keeping them straight. Exhale while lifting the legs. Feel the abdominal muscles working hard as you do this. Raise your legs to the level you are able to do with good form. Aim to raise them parallel to the ground (hip bent 90 degrees) or a little higher. Slowly lower your legs back down to vertical, inhaling. Maintain the posterior pelvic tilt even at the bottom of the movement. Do 10 repetitions in a set—or as many as you can manage. Try to do 30 repetitions in total. Avoid these errors to get the most from this exercise and prevent strain or injury. Concentrate the motion in the abs and hip flexors, don't swing to raise your legs with body momentum. Avoid swinging or swaying. Keep your shoulders pulled down to help protect them during this exercise. Your muscles are working hard during the lowering phase, and if you rush it you will miss this benefit. You want the descent to be controlled and without any swinging or swaying. You can perform this exercise in different ways depending on your fitness level, to make it easier at first and to give more of a challenge as you progress. If you have difficulty bringing your legs up, try the bent leg version. Fold your knees 90 degrees and use your abs and hip flexors to bring your knees up to your waist. As you develop strength in doing this with good form, work on extending your legs when your knees reach your waist, and lowering the extended legs. If the bent-knee hanging leg raise is too difficult, switch to using the captain's chair (vertical leg raise). It has a back pad and arm pads to help keep you in position. Your forearms are on the arm rest. The incline leg raise the lying leg raise are other easier variations. To increase the difficulty, you can continue raising your legs up to shoulder level, which will give more work to the rectus abdominis (the six-pack muscle). When you are ready to progress, you can add ankle weights or hold a dumbbell weight between your ankles. Extending and bending your knees while in a raised position will provide a further challenge. One-arm hanging leg raises with straight leg or bent knee are another advanced version. 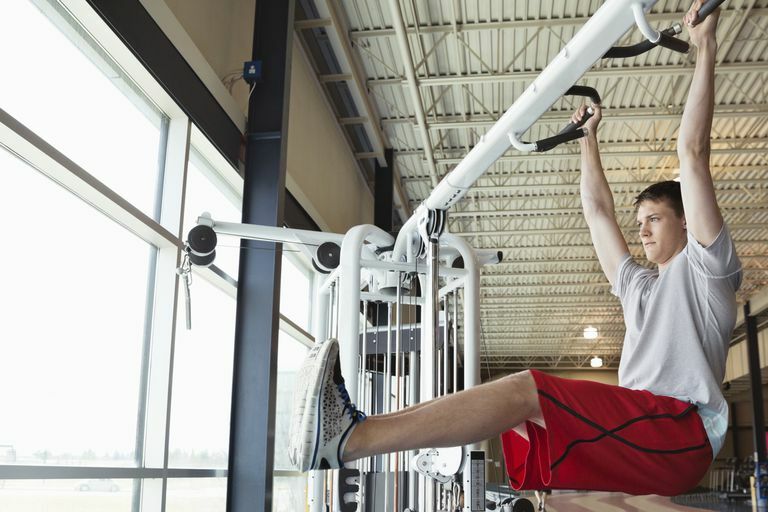 Ensure that the gym where you work out has made an investment in stable, well-maintained apparatus so you will be able to hang from it safety. If you have certain health conditions, injuries, or are recovering from surgery, it's a good idea to check with your doctor before starting an exercise routine or adding something new to your workout. You may need to avoid hanging leg lifts if you are pregnant or recovering from childbirth, have rectus diastasis, recently had surgery on your abdomen, or are recovering from injuries or surgery involving your back, neck, arms, or legs. Ask a trainer at your gym or a physical therapist for recommendations on which exercises would be better substitutes. Stop this exercise if you feel any pain.